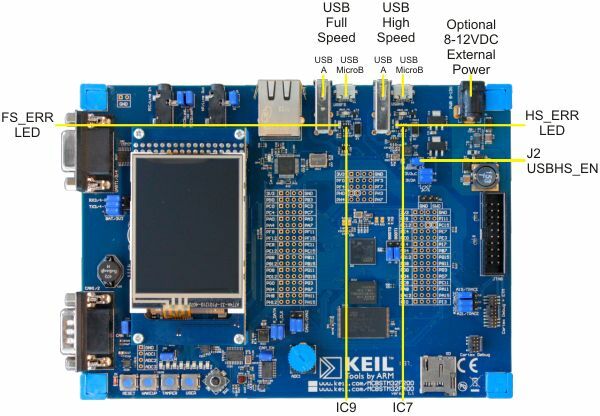 The MCBSTM32F200 board supports connectors for both USB full-speed and USB high-speed operation. USB Device: In this mode, a USB A to Micro B cable may used to connect to a PC. The board may be powered through this USB interface. USB Host or USB OTG: In these modes, a Micro A USB cable is used to connect to a USB device or a USB OTG device. A USB host or USB OTG interface must be able to provide enough power to the connected USB device. When USB power from the PC is insufficient, power the board using an external 8-12 VDC power adapter. Both the full-speed and high-speed VBUS power is switched with an STMPS2141 (IC7 and IC9), which provides, over current, short circuit and over temperature fault protection. The FS_ERR and the HS_ERR LEDs indicate when any of these fault conditions exist for the full-speed and high-speed VBUS signals, respectively. Jumper J2 must be installed to enable the USB high-speed controller.